Skewering a hillside in north London’s Hampstead, Uphill House is a detached family home clad in kiln-fired larch. The design, by Robert Dye Architects, has the open-plan personality of a New York loft and a formidable view from the master bathroom all the way south to Croydon (on a clear day, anyway). The initial brief was to extend an existing house built in the 1970s, designed by architect Ted Levy, which turned out to be a ‘bit of a banger’ according to Dye. ‘It was the wrong house in the right place and it was begging to be something else,’ he says. ‘The killer blow was when we did some investigations on the original house and found the original architect had used lots of asbestos. It was built in a semi-commercial way with the under floor ducts lined with asbestos. So the project took off in the new direction,’ says Dye. Dye realised that designing a completely new house (as opposed to an extension) would solve many of the site’s problems, as well as creating an extra storey, adding parking and avoiding paying a hefty VAT bill on the project. The client rolled with it and came back with a bolder brief for an open plan, modern house. ‘The couple had met in Manhattan, where they lived together in an open-plan loft and, even though they have two kids, they didn’t want to lose that world,’ says Dye, whose adding of a whole new storey doubled the size of the home from 250 to 500 sq m on the same plot. Inside, the house is divided into sleeping and living zones. 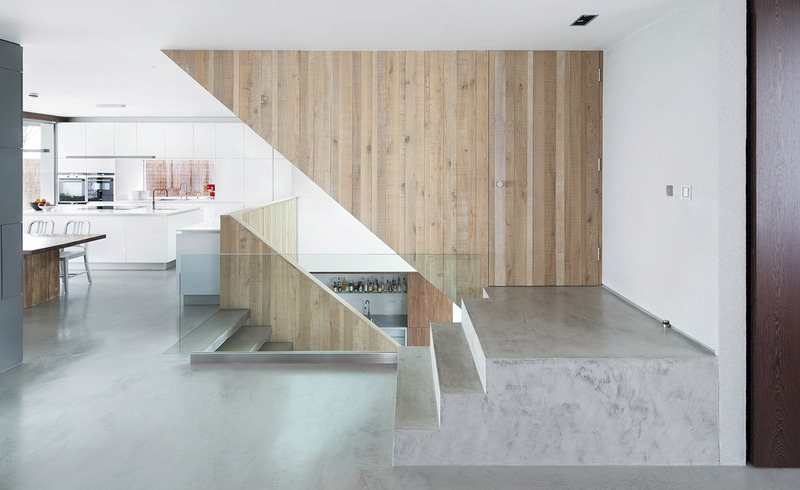 The spaces connect through the open stairway, which anchors the split level layers together. 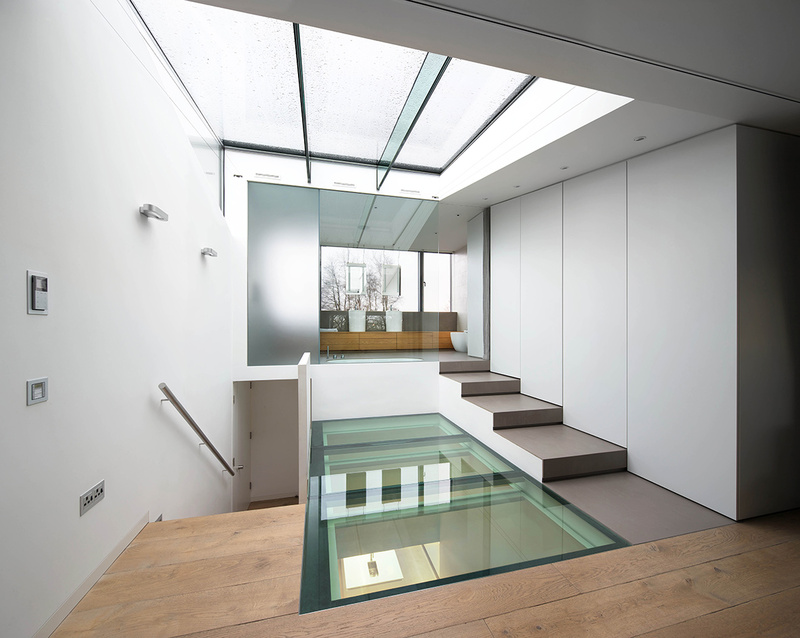 At the upper level, which contains the master bedroom, a skylight opens up and a glass floor on the top landing casts light into the central atrium below. The house opens up to the garden behind; yet, by using architectural devices, Dye closed the house off to the busy main road at the front. ‘The leafy, windy road at the back of the heath is a commuter short-cut,’ he says. He limited the openings at the front to reduce the sound of the traffic. ‘There is a sense of the outside but it is also somehow shielded – that was a very successful aspect,’ he says.